A team from Stagecoach North East was invited to visit the Daisy Chain farm in Norton after helping to raise £750 in April for the charity. 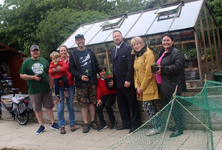 A community enterprise from Sunderland will be taking to the neighbourhood again this summer to spruce up the community thanks to a boost from Stagecoach North East. Stagecoach North East has urged politicians to take tough action on congestion and put buses at the heart of their plans to improve local air quality across the North East. A bus driver from Newcastle has won heaps of praise from both passengers and his company for his customer service skills and been rewarded for his commitment with a Service to the Community Award.